Why Democrats See Opportunity In This Key State Office The tight governor races in Kansas and Georgia, where the Republican candidate is also overseeing the election, have motivated Democrats to elect secretaries of states in other places. Deidre DeJear is the Democratic candidate for Iowa's secretary of state. The majority of states hold partisan elections for the person who also oversees the state's elections. The secretary of state, as the role is often called, is the chief election official and in most places that person is a Republican. As some Republican-led states have adopted strict voting laws, Democrats have made many of those races a priority this year. 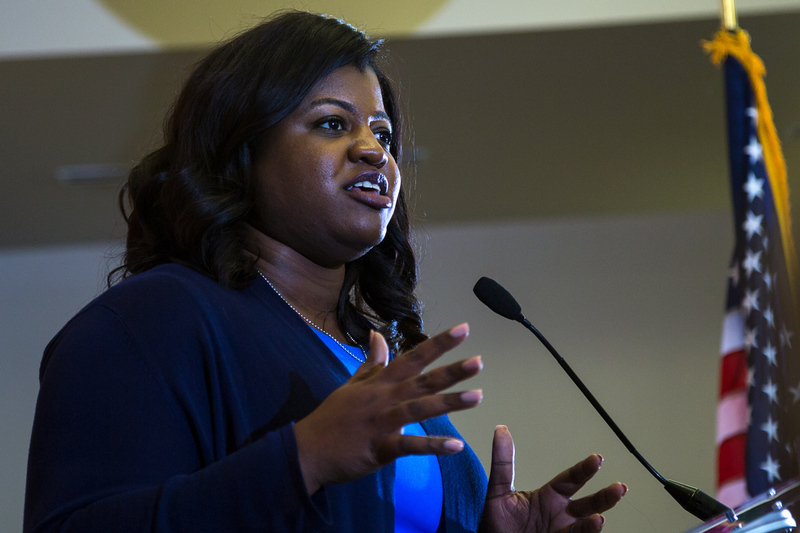 In Iowa, a state which leads the presidential nominating process, Democratic politicians flirting with a presidential run in 2020 are already jockeying to get on stage with Deidre DeJear, the Democratic nominee for secretary of state. The 32-year-old is a rising star and the first African-American nominated by a major party in Iowa. 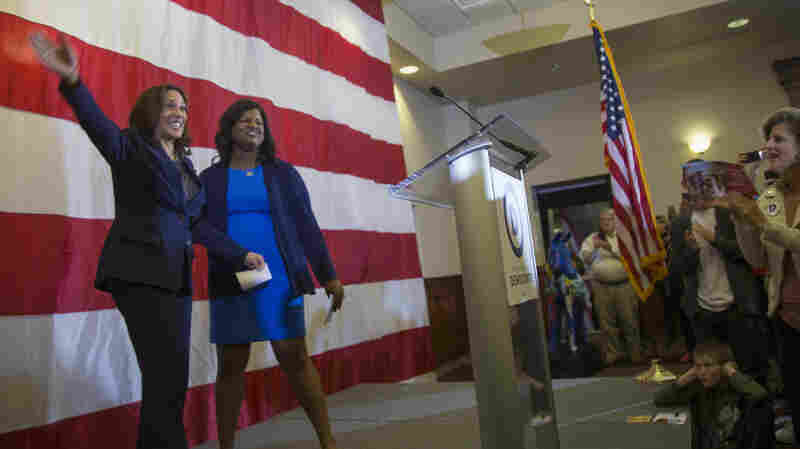 "There is so much on the line and electing Deidre DeJear will be a statement about who we are as Americans," California Sen. Kamala Harris said to a cheering crowd of Democrats last week in Des Moines. DeJear is a small-business owner and worked on former President Barack Obama's campaign. She's running to unseat Republican Secretary of State Paul Pate who is phasing in a new voter ID law. This year, Iowa voters without IDs will be allowed to sign an oath of identification attesting they are who they say they are. There are competitive races for governor and at least two Republican held U-S House seats on the ballot. Democratic Sen. Kamala Harris in Iowa supporting the campaign of Deidre DeJear, candidate for state secretary of state. DeJear says, when it comes to voting, she wants to "make it welcoming and strip away the partisanship so people feel inclined to vote, and they also understand the value added when they do participate." She says she's not running on overturning the state's voter ID law, but trying to increase turnout in all elections. "Young people, racial minorities, people who have moved, these are people who are Democratic constituents for the most part," says Rick Hasen, a University of California-Irvine election law expert. "These are the people whose strict registration or voter identification laws could end up discouraging or disenfranchising from voting in the election." "Would you rather have someone from your team or the other team in charge?" Hasen asks. "My view is it should be someone from neither team, but that's now the situation is set up." Take Georgia for example. There, Republican Secretary of State, Brian Kemp, is running for governor. Former President and Georgia native Jimmy Carter has personally called on Kemp to resign his position overseeing the state's elections after months of accusations that his office is suppressing the vote. In Kansas, the secretary of state, Kris Kobach, recused himself from the close primary vote count against the state's incumbent governor. And in Iowa, while there is no proof of widespread voter fraud, Secretary of State Pate, 60, says showing an ID is like the key to your house. "I'm sure everybody in the morning, when they leave their home, they lock their door," Pate told Iowa Public Radio's River to River recently. "It doesn't mean someone's broke into your home, but you're protecting what you find is valuable. And that's what the ID component does." Pate regularly points to public opinion polls supporting voter ID in the state. Now, Pate's out with an ad where he's holding a football and dressed in a black and white stripe referee outfit. "As Iowa's Secretary of State it's my job to be the referee," Pate says in the ad. "Not to wear a team jersey. We're going to make sure your vote counts. Easy to vote and hard to cheat." "If we really want to think about a sports analogy, you've got refs, you've got players and you also have a commissioner," Deidre DeJear says. "His job is not to be the ref. Those are our auditor's jobs."